Share the post "Bringing the Animal Science Community Closer Together: A Veterinary Science Club Halloween Mixer"
The Rutgers University Veterinary Science Club (RUVSC) hosts an annual Halloween Mixer for preveterinary students and Animal Sciences faculty in Bartlett Hall that traditionally includes food, music and department trivia. However, this year our club expanded the event by inviting members of the new Animal Science Alumni Steering Committee organized by the Department of Animal Sciences. 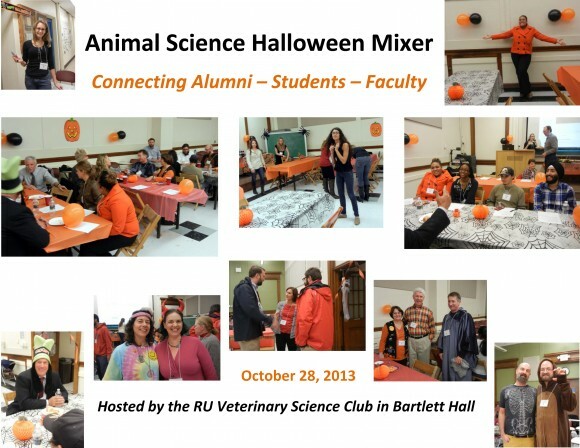 With well-established veterinary practices, these Rutgers graduates were more than happy to share their knowledge with current animal science students during a Halloween-themed night. On October 28, our club members transformed the Bartlett Hall 123 classroom into a festively decorated environment. Long tables were set up and the alumni and faculty mingled among the students at each table. Groups of students rotated from one table to the next when a signal was given and asked questions about the alumni’s Rutgers and vet school experiences and the faculty’s career paths. Alumni and faculty freely shared their reflections and career advice. The Halloween Mixer allowed us to connect with faculty and alumni by hearing their stories and relating to their experiences as undergraduates. We had a great turnout, and the students were thrilled to get to know new faces and learn more about the faculty. Our club advisor Sarah Ralston, also a veterinarian, noted “it was a great networking experience. I think the alumni enjoyed themselves, and it was of tremendous benefit to the students.” Daniela Sharma, Animal Science Undergraduate Program director and Ph.D. alumna, summed up the experience by saying “the mixer was a great learning experience for all of us. It’s always fun to see alumni and relive the college experience with them.” Other faculty participants included Susan Becker (a B.S. and M.S. alumna), Department Chair Carol Bagnell, Wendie Cohick, Barry Jesse and Troy Roepke. 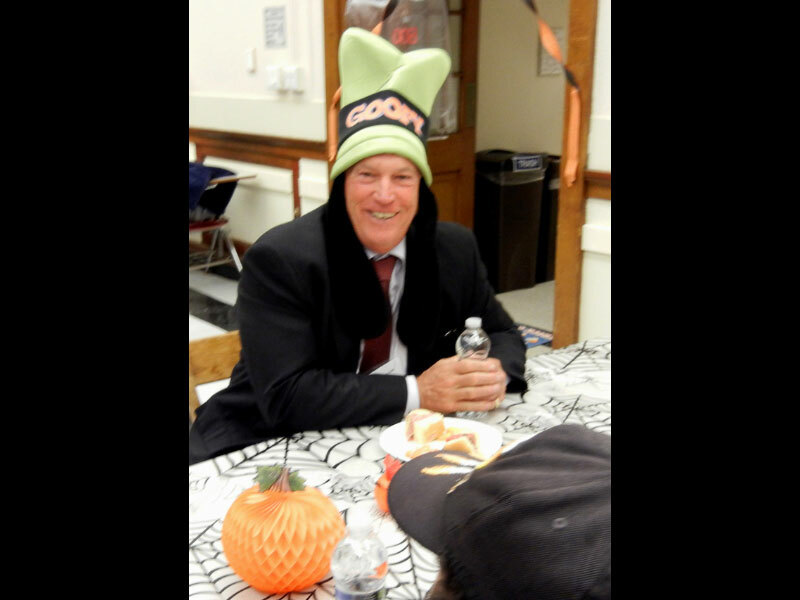 Assistant Dean Lee Schneider, a three-time Rutgers alumnus, attended wearing a “Goofy” hat. Other faculty apparel ranged from a scary bear costume to a ‘60s flower child. With such a great turnout, the Veterinary Science Club does not plan to stop the networking here! RUVSC is working to continue involvement with the veterinary alumni and faculty of Rutgers by planning future events to bring our Animal Science community even closer together. Assistant Dean Lee Schneider wearing a “Goofy” hat.